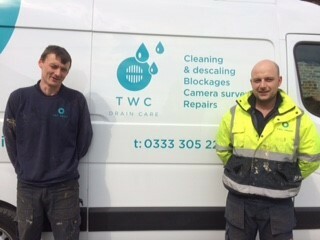 Get to know our Drain Care Engineers Danny and Grant in the third instalment of our Meet Our Team series! Meet the TWC Drain Care engineers. Danny has been with the company for over a year and Grant is the new edition to the team! Both engineers have years of experience in the drain/gutters and septic tank industry. Our engineers love the fact that every day brings new challenges and turning out to a customer when they have an emergency situation and being able to reassure and resolve their problem, gives them both great job satisfaction. Both engineers have been praised for their friendly customer service, professionalism and polite manner, winning them 5-star ratings on our reviews page. If you have a blocked drain/gutter or need a new septic tank/treatment plant installing, then please get in touch with the Drain Care Team on 0333 3052243 or visit our dedicated drain care page.